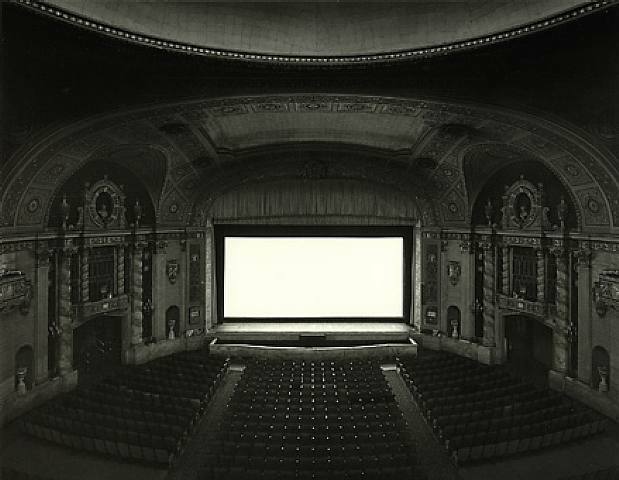 I share the image above, which was made by the artist Hiroshi Sugimoto, because every single theater practitioner who reads this blog simply HAS to know about his series of theater photographs. Here’s what he does: he finds historic cinemas, rents them out, places his camera in one position, opens the shutter, screens an entire film, then closes the shutter when the last frame of the film has flown by. The resulting screen is entirely white, because every single square inch of it, at some point during a film, emits light. The light, in turn, illuminates the details of the theater… but in such a way as to make the space seem mysterious, antique, meaningful. The container for the art (the theater) becomes the art itself… and the art, in turn, becomes the container, inasmuch as the white rectangle of film light is sort of an inverted frame for what’s beautiful in the image. Then again, there is something beautiful about the rectangle of light itself: all of the whirling loud activity of a film, whipping through time, reduced to motionless (if luminous) simple geometry. Sugimoto had this to say, furthermore, about the light on screen: “Different movies give different brightnesses. If it’s an optimistic story, I usually end up with a bright screen; if it’s a sad story, it’s a dark screen. Occult movie? Very dark.” Is this what is left in our minds after we’ve watched a film? Do we retain a ghostly rectangle somewhere in our brain? And is this why we like film so much: because in the end, the story gets simplified in our (notably imperfect) memory? I’d like very much to believe that the same thing doesn’t happen with theater, but I’m afraid it probably does. The complexity of a well-made play gets reduced, in some way, in the reflective memory of the viewer. Rough edges sheared off, characters’ contradictions resolved erroneously, until the whole story is somehow simplified, leaving us only with impressions. What rescues that simplification for me is the thought that—as with Sugimoto’s theaters—perhaps we become the art. The story, having worked its way inside us, illuminates us from within, making us feel more beautiful and meaningful. Yes. I like that very, very much.